Saimoe 2011: Block A-D Predictions (Round 3) | ›› awesmoe - moe is serious business. Well, I like Mikoto a lot too (when she’s not beating Homura) so I guess it’s okay. She’s definitely a worthy block finalist. Erica is one of the stronger strike witches so I think she’ll win. Suzuha is nice and Steins;Gate was amazing, but she lost a bit of focus near the end. It should still be a close battle, but for some reason Suzuha just doesn’t strike me as a character that would make it to the block finals, whereas Erica certainly does. I love them both so I’ll be happy with either one of them winning. And as far as predictions go, either one of them could win. I’m going with Kurisu because Steins;Gate was more recent and left an amazing impression even if the ending was a bit dull. On the other hand Astarotte no Omocha! was pretty generic and only had Lotte’s cuteness to remember. It’s a good thing this match isn’t on the same day as Erica’s; Tenshi would have a hard time keeping up with the block votes. Strike Witches may be strong, but I don’t think I’m underestimating Gertrud this time. She only barely beat Ryuuko even though the Denpa Onna faction gave up after Erio, whereas Tenshi totally destroyed Tsukasa. So yeah, Tenshi’s going to win (she’s more moe than Gertrud anyway). If MadoMagi loses Madoka, it’s all over. I’m not much of a Madoka fan, but I still like her more than Elly for sure, and I hope she wins. It shouldn’t be too difficult, because Milky Holmes tends to falter and I’m sure they know that they don’t stand a chance against Madoka. Another match that could go either way. Index faction has been impressive, but Last Order doesn’t really seem to get a lot of support. On the other hand, Yuno is Hidasketch’s last and strongest hope. Again, either one of them could win, and the fact that I’m writing this up so far in advance doesn’t help seeing as how it somewhat depends on Mikoto’s performance. A-Channel may be strong, but Yuuko’s performance felt slightly disappointing, even though she did win. 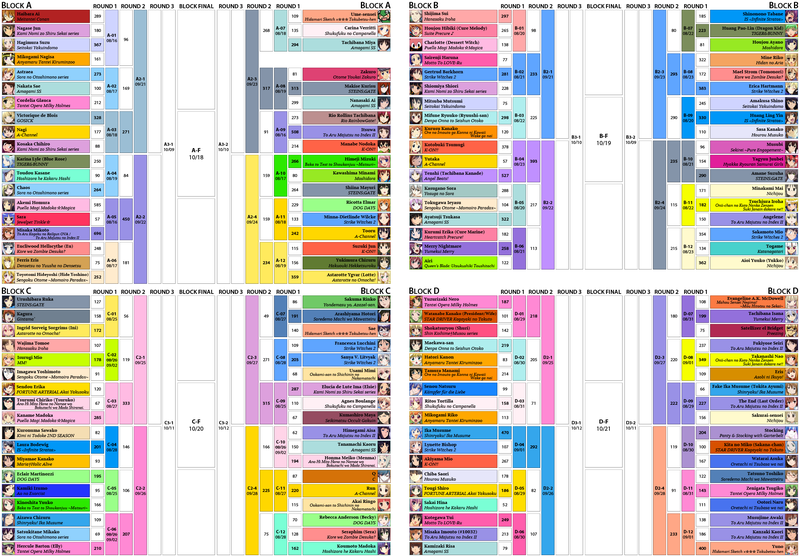 On the other hand, Kaminomi has been great, with Elsie beating Sanya and Haqua beating Ohana. Definitely predicting an Elsie win since Run is around the same level as Sanya. 3. Ika was way stronger than Nero to begin with.